Kevis Hendrickson is an aspiring filmmaker and the author of four Science Fiction and Fantasy novels, including The Legend of Witch Bane and the Rogue Hunter series. His second novel Rogue Hunter: Quest of the Hunter won the Red Adept Annual Indie Award (2010) for 'Top Science Fiction'. His most recent novel is Rogue Hunter: Inquest. The sequel Rogue Hunter: Dark Space will be out on October 1st, 2013. Tortured and near death, Zyra Zanr is held hostage by a group of rival bounty hunters aboard their ship, Lilith. Zyra escapes, but her captors are determined to recapture her. Revenge is on Zyra’s agenda, as she intends to teach her former captors a lesson. 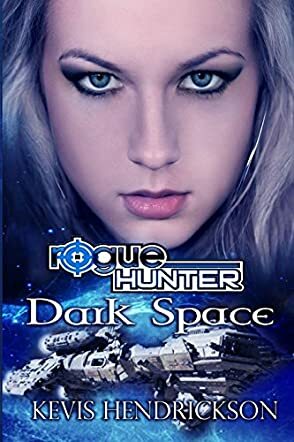 Dark Space is Book II of the Rogue Hunter series by Kevis Hendrickson. The action starts from the very beginning. Zyra’s ship is attacked and she is hurt. Fast-paced and vividly portrayed, readers who crave this level of intensity would definitely be enjoying themselves. The plot is tightly written and the writing style is straightforward yet deft. I also enjoy the sharp and witty dialogue. Zyra is a tough and gritty female protagonist. As a reader who always appreciates a good, strong female character, I gravitated towards this bounty hunter since she was introduced in the series’ first installment, Inquest. Even though this is a second installment, readers do not necessarily have to read the first book – although they should to fully enjoy the story and read more about Zyra’s past. I find Book II is a commendable continuation from Book I. My favorite part of the story is when Zyra turns the tables on the Lilith’s crew. Readers would find some parts of Dark Space, including the language, quite graphic, yet this is suitable for a mature read and the concept of the story as a whole. All in all, a solid sequel for this entertaining series from Kevis Hendrickson and I look forward to the next book.